My surfing companion looked glum. He invested in start-up companies and it had been a bad year. “I lost more than $200 million this year,” he said. “That was careless,” I said. His companies had crashed and burned while companies with inferior products flourished as government incentive schemes underpinned their take-off. Government schemes and regulation are central to the profitability of many sectors of our economy. Economists Paul Frijiters and Gigi Foster have found the majority of Australia’s rich list made fortunes in sectors such as mining, property development and banking, where success is built on favourable government decisions. Even industries whose fortunes aren’t as obviously determined by political decisions still need to have strong relationships with government. Governments often don’t understand the nitty-gritty of the industries they regulate; they need the reality check of talking to people on the ground. And when they’re arbitrating between competing stakeholders, their decisions are shaped by who is in their ear. Politicians often argue lobbying is going to happen anyway, so there’s little harm in demanding donations from those seeking their time. They argue that as long as they’re collecting small amounts of money from a lot of different players, there isn’t really a problem. And they claim this is a better way of funding election campaigns than calling on the public purse. Those who disagree argue that the logic of “paying for access” is that people who pay more get better access. The risk, they say, is that big business gets a louder voice than small businesses, communities and ordinary people. More worryingly, it’s unclear whether access is the only issue. Our political donations disclosure regime is so opaque that we don’t really know who is paying how much and what they get in return. But the lengths players go to hide donations suggests we should be suspicious. 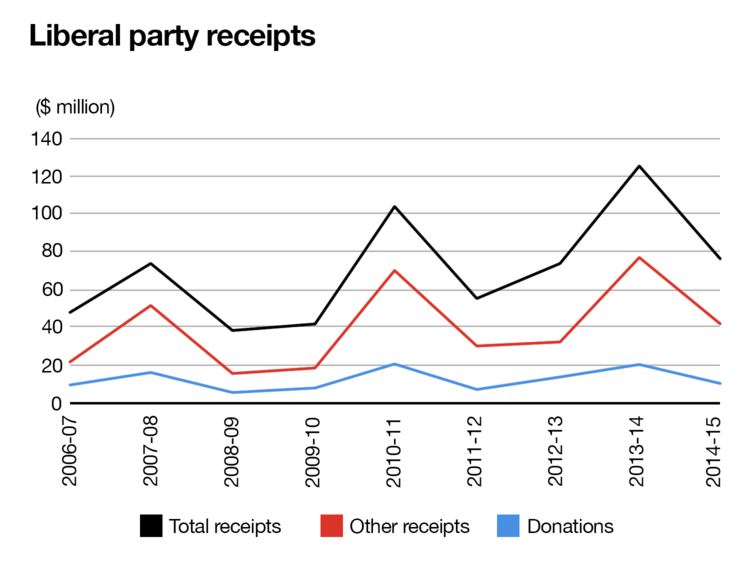 The Liberal Party holds its donors closer to its chest than Labor, so consider this graph of Liberal Party receipts over the last decade. The gap between the top two lines is the money we know nothing about. Laws dictate that only donations of more than A$13,200 have to be disclosed, but as the major parties have seven state and territory branches as well as a federal branch, a large donation of, say, A$100,000 can easily be hidden by breaking it into small chunks and giving a portion to each branch. Second, we have the gap between the “Other receipts” and the “Donations” line. Little information is released publicly about these payments, but it’s supposed to be money the parties receive that is not from donations. Close examination reveals companies are making payments in this category that are many multiples higher than their declared donations. In the last ten years, for instance, ANZ Bank has publicly declared that it gives the same donation to each side of politics – A$50,000 to A$100,000 each year. But, in election years, it increases the donation to the Liberals to A$150,000. But, the “Other receipts” show the total was up to nine times the size of the ANZ’s declared donations. This money flowed much more strongly to the Liberal Party and peaked (almost doubling) in the years crucial decisions were made about financial sector reforms. These payments may be entirely legitimate, but based on the publicly released information we can’t really tell. Even declared donations that appear in the bottom (blue) line in the graph above are not transparent. Many of the biggest listed donors are shell organisations, such as the Free Enterprise Foundation, which take payments from companies and then pass that money onto political parties with no names attached, effectively laundering donations. This lack of transparency makes it hard to speak with certainty about the impact of money politics on government decisions. But looking at the trend lines, we can see worrying signs that suggest donations are used to coax and punish governments for their decisions. The Rudd government, for instance, received A$85 million on the eve of its first election victory when business was keen to get in its good books. But donations slumped to just A$22 million in the 2009-10 financial year. A drop-off in non-election years is normal, but this drop was extreme and not echoed for the Coalition. Interestingly, the dip happened while Labor was still flying high in the polls and before the Rudd/Gillard divisions began; it was while Labor was seeking to implement changes to the WorkChoices industrial relations law, banking sector reform and the mining tax. It was at the end of this same period that the then treasurer, Wayne Swan, published his notorious essay in The Monthly, The 0.01 Per Cent: The Rising Influence of Vested Interests in Australia. He argued corporate elites were pouring their considerable wealth into trying to pervert the political process, and that “the rising power of vested interests is undermining our equality and threatening our democracy”. It’s clear that having a close relationship with government is an important part of business success in Australia, but the precise role of political donations in that relationship is opaque. The only thing we know for certain is that, in this election campaign, millions of dollars is changing hands, the relationships created by these donations matter, and we don’t know as much about political donations as we should.